If you are a senior and/or middle manager in organizations and industries, this journal is for you. Journal of Business Strategy contains articles from leading academics as well as business writers and consultants. The articles have a practical focus designed to help develop successful business strategies. The journal covers the following topics: diverse marketing strategy, innovation, developments in the global economy, mergers & acquisition integration and human resources. You will find articles unlikely to be found in other business publications. Some of the key benefits of the journal are: sharpening and broadening leadership skills, fostering innovation and inventiveness in a corporate structure, and new ways to leave the competition behind. 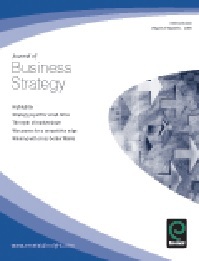 Journal of Business Strategy is published bi-monthly by Emerald Publishing. The print version of the journal can be found in the periodical section of the Bellevue University Library, with coverage available from 2016 to the present. Journal of Business Strategy is also available via Bellevue University Single Online Subscriptions and Emerald eJournals from 2003 to the present. Originally posted in the Freeman/Lozier Library’s quarterly newsletter, More Than Books, V. 20 No. 4, Fall 2017.